Dinosaur Comics - March 6th, 2008 - awesome fun times! –JUDGE EVERYTHING BY THE SAME STANDARDS YOU'D JUDGE A ROMANTIC COMEDY BY DAY? March 6th, 2008: Okay, so this comic basically based on real life. My grandfather did pass away a while ago, and as part of his estate I received a pin from the 1935 Nuremberg Rally. It's really amazing to hold it: you get this sense of history being alive and leaving pieces of itself behind - a sensation I haven't gotten from the rhetorical "history books" before. I also have the same issues T-Rex has: you don't want to throw it out, you can't give it away, and you don't want to sell it. It turns out that the pins are pretty common, so museums don't really want them either. 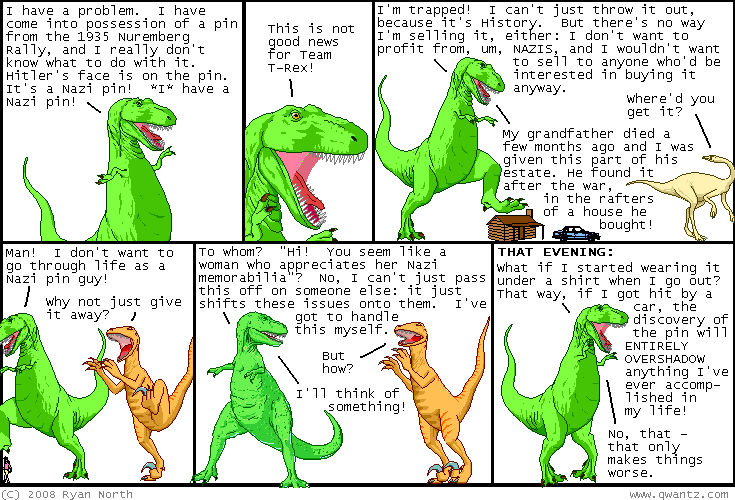 Anyway everybody please remember I wrote this because when my house burns down and all they find in the rubble this solid metal pin, I'm gonna need the internet to back me up on the "not a Nazi" thing here. You can read more about the Nuremberg Rallies on Wikipedia.